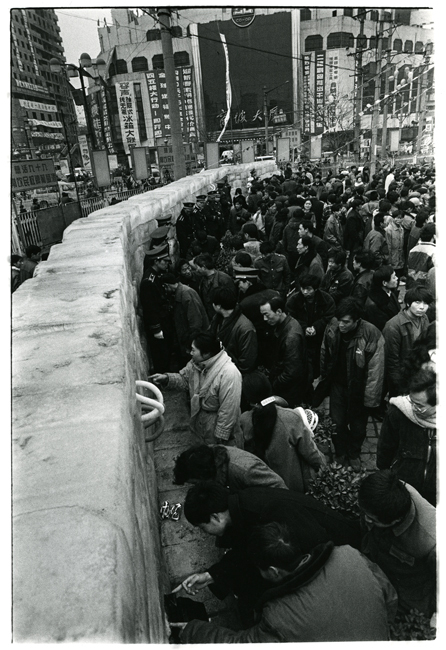 Wang Jin, Ice · 96 Central Plains (1996), performance and installation. Courtesy of the artist. The plan is to invent the means in a common experiment launched from any kitchen, any back porch, any basement, any hall, any park bench, any improvised party, every night […] planning in the undercommons is not an activity, not fishing or dancing or teaching or loving, but the ceaseless experiment with the futurial presence of the forms of life that make such activities possible. A wall of ice spanned the plaza of a shopping center in Zhengzhou, China, each massive brick encasing a consumer good. 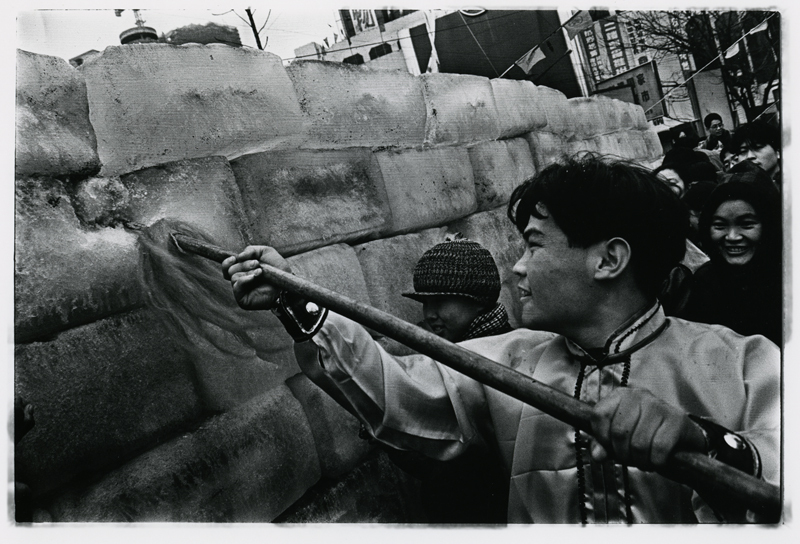 This installation, Ice · 96 Central China by the artist Wang Jin (王晉), allegorized the Cold War thaw, and the deluge of commodities that followed in China. City residents did not wait for the wall to melt, as he had planned. They took up picks, rocks, and even spears to liberate the goods themselves. 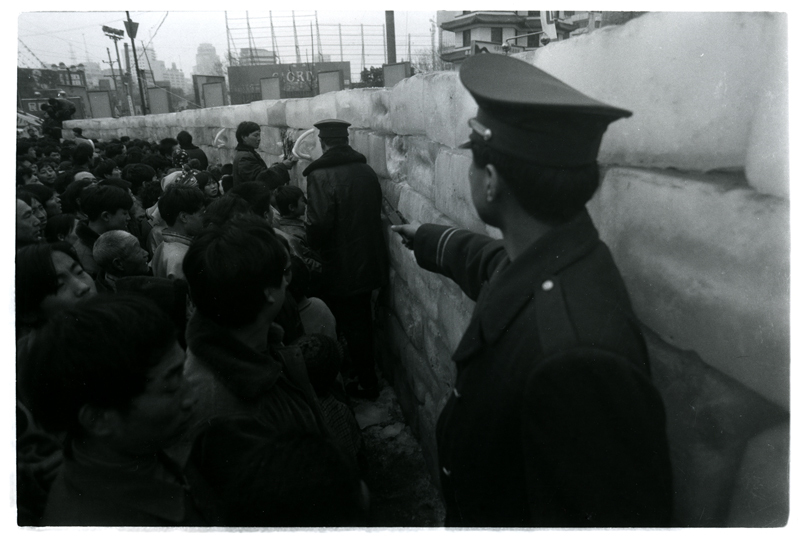 I was born in the 1990s a few years before Wang’s project, in an affluent corner of Beijing, in a cemetery of central plans, at the end of a century of men who laid plans like hens lay eggs. In its time, central planning was not just a method, but an ethic. Think of Otto Neurath’s command-and-control war economy, or Robert Moses’s ruthless reshaping of New York City’s transport; or the feminist vision and racist effects of Margaret Sangers’s revisioning of the family. Since the time of the planners, walls have come down: the economy, the city, and the family have each — in their own ways — been declared markets, much the way wars are declared. This idea of the market, as an efficient means of sorting information, was staked out in a pitched battle between markets and plans called, retroactively, the Socialist Calculation Debate. The question was: is it possible to efficiently allocate the factors of production through central planning? Nearly a hundred years later, it’s clear that markets won, but back then the most common answer was surprisingly, resoundingly in favor of planning. We could have the market as pricing mechanism without competition as a political reality. With a model that was smart enough, and computers that were fast enough, a state could capture the benefits of competition far better than a free market. (The latter had an icky way of turning into monopolies and oligopolies.) Exeunt the market, enter the plan, which was destined to transcend the market like an actor transcends her character. The problem with planning, then, was never an economic one. The theory checked out and the math worked fine. The Austrian School, as represented by Ludwig von Mises and Friedrich Hayek, won the Socialist Calculation Debate not as economic but as political theorists: they held that any project of central planning would inevitably divide the world into planners and the planned. This is the libertarian critique that secures neoliberal market ideology; Hayek, the intellectual hero of the free-market right, famously termed the hubris of the central planner (whether corporate or socialist) the “fatal conceit.” I wish that more of us on the putative left would read Hayek’s unrelenting assault on institutionalism. Modifying this phrasing, the historian Matthew Connelly has called bureaucratic overreach in the history of family planning its fatal misconception. Although many women benefited from access to contraception and abortion, policies were often meant to work against rather than towards women’s self-determination, Connelly argues: “It was meant to imply that parents would do the planning, when in fact, in some states, the states coerced them, and in all of them, they employed market means to shape preferences.” Family planning was, in most places, part of population control (Indira Gandhi’s emergency, People’s Republic of China’s one-child policy, and Depo Provera in Puerto Rico come to mind). What counts as a plan? Who do we count on to plan? Though the word economy comes from the two Ancient Greek words oikos and nomos, meaning the household’s ordering, it has come to name everything outside the home. We often call that which is outside the economy priceless: parenting, romantic love, friendship. Sociologists like Viviana Zelizer show that we in fact price these things all the time, whether through adoption fees, children’s insurance, divorce settlements, or split restaurant bills. (“For everything else, there’s Mastercard.”) Furthermore, she shows how the “two worlds” hypothesis (that there is the economy, the world of cold prices, and then there is the soft stuff that really matters to us) gets called on at funny times for certain purposes: to turn down a homebound partner who demands wages for housework, for example, or to demonize a foster parent who asks for payment. In cases like this, the invocation of the priceless is a way to skirt the bill, as Marilyn Waring’s classic If Women Counted shows in the case of GDP valuations of labor. Mothering is a way not just to write genealogies of the past but to extend them into the future. If the central planner always seemed to plan someone else’s life, the mother who plans a family is part of her own plan. 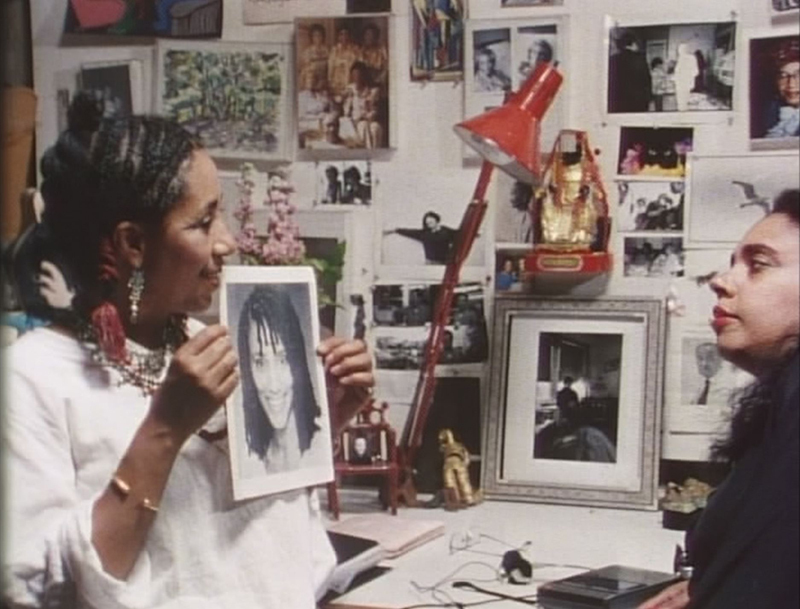 Camille Billops and James Hatch, Finding Christa (1992), 55:00. Courtesy of Third World Newsreel. Artist Camille Billops’ archival experiments with her own kith and kin suggest a speculative theory of family planning on these lines. In the late 1980s and early 1990s, she created a family trilogy of experimental documentaries in collaboration with her longtime partner James Hatch. The middle film, Finding Christa, redefines maternity through an account of the return and rapprochement of a daughter who had been given up for adoption years earlier. The work documents the unplanned return of the artist’s daughter. Christa has clearly come asking for a mother, and the film is Camille’s answer. The first half follows the artist’s reflection on her decisions and its reverberations (the endless disapproval) among her social world and family; the second half traces the full-grown daughter’s artistic growth as a singer and actress. As Julie Lesage puts it, this film turns the autobiographical genre into a mutual biography: Christa through Camille’s eyes, Camille in Christa’s voice. Finding Christa dives into the limits of motherhood by drawing attention to how an act like giving up a child for adoption can itself be an expression of maternal care. Billops insists, both in interviews and in the footage she cuts for the film, that it was better for them both; if every choice must also include the possibility of its own refusal, we begin with giving up the child. As Christa and Camille flip through old (family) albums in one scene, they chance on several images that Christa finds especially delightful. She asks to keep them. But Camille refuses. Even as Camille refuses to fully claim Christa as her daughter, she also refuses to renounce her memories of Christa: the “mine” in “daughter of mine” and in “memories of mine” are not the same. Planners in the twentieth century often thought of themselves as giving birth to a new society. Taking this maternal metaphor, birth, as a material one, I wonder: what are the ways that mothers (in all their temporalities: expecting and empty-nesting, actual and potential) already plan? In ascending order of intelligence: a plan is a market is a computer is a mother. For the most important theorist that you have never read but will, I hope, read right now, Sylvia Wynter, the rebirth comes before the birth: baptisms, birthday parties, rites of initiation, and the bureaucratic rituals of adoption. These occasions are when we come to recognize our kin, whether we’re related by blood or not: uncles, friends, comrades, co-ethnics, boys and girls and more. Looking back, we know we must have been born first, but it’s an awareness we can only have after rebirth. And so the homo narrans dwells within stories, the most important of which is the myth of biological origin. This is probably a sketch of an ideal; it might be sketchy, since I am not pregnant and do not have to plan around this possibility. I have never fought in reproductive combat. When I wonder why my mother’s story is so opaque to me, I recall the idiom: every house has a book of scripture that’s hard to read (家家有本难念的经). Mom knows where this book is kept, in a safe with the other valuables. It may be a lifetime of opportunity costs written in cash. Priced.